The Tar Heels will play Florida State at 1 p.m. on Sunday in the NCAA Women's Soccer championship game in Cary. • The Tar Heels will play Florida State Sunday at 1 p.m. in the NCAA Women’s Soccer championship match at Sahlen’s Stadium in Cary. The game will be nationally televised on ESPNU with Jenn Hildreth on the play by play and Julie Foudy on the color commentary. 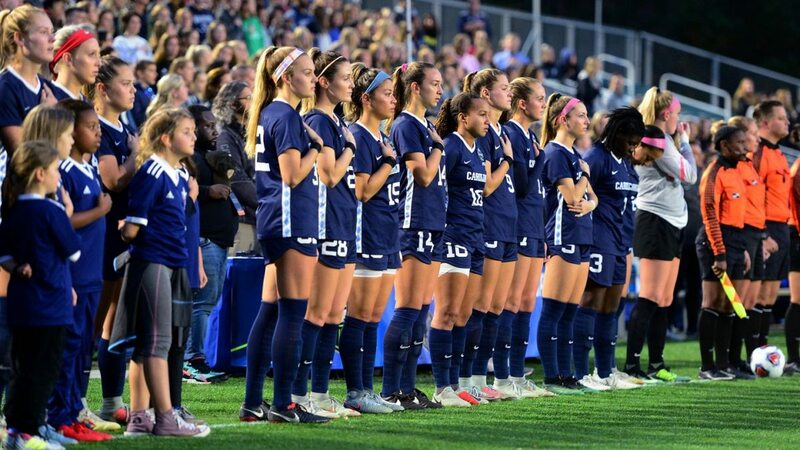 • After beating Georgetown 1-0 on Friday in the NCAA Tournament semifinals, Carolina improved its all-time tournament record to 131-13-4, a winning percentage of 89.9 percent. The win over Georgetown improved Carolina to 25-3 all-time in NCAA Tournament semifinal games with losses to Notre Dame in 1995, Santa Clara in 2002 and West Virginia in 2016. • The win over Georgetown Friday improved Carolina to 7-0 all-time in NCAA College Cup games played at Sahlen’s Stadium in Cary. Carolina won NCAA titles at Sahlen’s Stadium in 2003 (wins over UCLA and Connecticut), 2006 (wins over UCLA and Notre Dame) and 2008 (wins over UCLA and Notre Dame). • Carolina has played the majority of its home games at WakeMed Soccer Park’s Koka Booth Stadium while construction of the new UNC Soccer & Lacrosse Stadium on campus continues. Sunday’s match will mark the 12th straight game Carolina has played at the WakeMed Soccer Complex (eight games at Koka Booth, four games at Sahlen’s Stadium) dating back to a match against Boston College on October 18, 2018. • Sunday’s appearance in the championship match will mark the 25th title game appearance in history for North Carolina. Carolina is 21-3 in its previous 24 NCAA championship game appearances. Carolina won titles in 1982, 1983, 1984, 1986, 1987, 1988, 1989, 1990, 1991, 1992, 1993, 1994, 1996, 1997, 1999, 2000, 2003, 2006, 2008, 2009 and 2012. Carolina’s only losses in the title game came against George Mason in 1985, Florida in 1998 and Santa Clara in 2001. • In his 40th year as the Tar Heel head coach, Anson Dorrance is now 847-73-40 all-time in his career as the women’s coach. That is a winning percentage of 90.3 percent. Dorrance won his 800th game as a women’s head coach against Wake Forest on Oct. 9, 2016. He won his 1,000th game as a collegiate head coach on Aug. 18 against Ohio State (he coached Carolina’s men from 1977-88 and won 172 games as its head coach and his win over OSU that day boosted his women’s win total to 828 at the time). • Carolina’s win in overtime against Georgetown on Friday improved Carolina all-time in NCAA Tournament overtime games to 10-3-3. Carolina is 40-17-39 all-time in overtime games. Read more about the women’s soccer team and Sunday’s game on GoHeels.com.